Fat biking in Lincoln City Oregon is quickly growing in popularity. If you’re looking for fun family friendly outdoor activities then check out Safari Town’s fat tire bike rentals. We offer partial and full day rentals. Customers can park in the rear of our shop and ride right from the store. There’s a crosswalk visible from the shop and you can literally be on the beach in about 5- 7 minutes. Here’s a few fat bike tips that will make your adventure safer and alot more fun. Try and ride when the tide is lower. Look up the tides and don’t go around any headlands that may be impassable at higher tide. 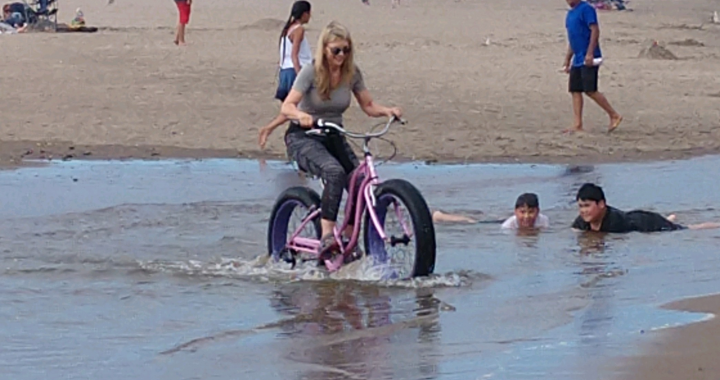 You want to ride safely and avoid getting trapped anywhere by the incoming tide. The hard packed sand is also easier to pedal on than the soft sand and there is lots more hard pack at the lower tides. Some guests like to ride down wind (wind at your back) and have someone in their group pick them up. You will need a van or pick up truck to haul the bikes back if you decide to go this route. Rinse your bike thoroughly with fresh water immediately after your ride. This will help get the corrosive elements off your bike. More information on fat biking in Lincoln City Oregon from Travel Oregon’s website. Posted in Things to do in Lincoln City Oregon.